I would hazard a guess that to most people Baby Bird means You’re Gorgeous. And much like Rob’s recent choice for record club, Dexy’s Midnight Runners, the presence of a gargantuan hit single that towers over the rest of an artist’s work has not only been misleading for those whose only exposure to the band is that one song, but has almost certainly been damaging to that artist’s critical and (possibly) commercial prospects. 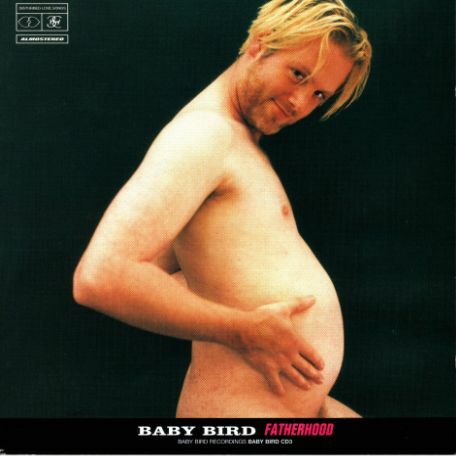 Baby Bird’s first four albums are nothing like Ugly Beautiful (the album that housed You’re Gorgeous) and shorn of the glossy, unsubtle production values and the somewhat overt bid for radio play, Baby Bird’s songs reveal themselves as twisted little oddities that very much reflect the (presumably) twisted mind of Stephen Jones, the man who created them. Fatherhood is the third of four home produced albums that proceeded Ugly Beautiful and is generally recognised as being the most cohesive and consistent of the four. It’s a slow burn of an album, very dark and brooding in the main, with pared down arrangements and a vast array of vocal styles (check out the falsetto in the Spacemen 3 a-like I Don’t Want To Wake You Up). In a similar way to my last choice for record club, it may sound on first listening as though there isn’t much going on. But closer inspection reveals a wealth of variation and subtlety – melodic alterations within a song, shifts in vocal intensity and delivery, lyrics that sound throwaway but are actually unusual and unsettling (examples: ‘And the rain comes down and it makes a fool of us. No-one sees it coming except the animals. We rely on the TV, so what does that say about us?’ or ‘Little girl that swings, watch me through your fingers. Holding on like murder to this failed old singer’ or ‘I hope all little girls will be safe when he starts to dream about fatherhood’). It’s all a far cry from ‘remember that tank top you bought me, you wrote ‘you’re gorgeous’ on it’. Whilst introducing the record, I tried to articulate that even though I really like this record, I’m still not sure it’s a particularly ‘good’ record. And, having ruminated on my fellow members’ confusion at this statement over the past 24 hours I suppose what I meant was that the one thing I like most about Fatherhood is that, 16 years on from first obtaining it, I still haven’t come close to understanding it – I have no idea what Stephen Jones’ motivations are! Is he laughing at us, or being sincere? Facetious or heartfelt? For me it’s a conundrum. And therefore, in much the same way as Lick My Decals Off Baby, Fear of Music (the least favourite but most listened to Talking Heads album I own) or the Guardian Xmas Crossword (the actual thing, not an album title), it keeps drawing me back, challenging me to unlock its mysteries and untangle its twenty strange little songs. Nick listened: A strange listen. I know Babybird from You’re Gorgeous, of course, but I’m also very much aware that before this he’d released a (very rapid) string of albums made up entirely of home-recorded ‘demos’ (I hesitate to use the word lest it seem like a pejorative; it isn’t), and that this was the most renowned of those records. Many of these songs felt like they would lose something – intimacy, spontaneity, diversity perhaps – if they were recorded ‘properly’ (although I was intrigued to notice that one of them was an antecedent of You’re Gorgeous; an earlier, rickety version with different lyrics, which almost prompted me to say “he’s always had a great way with a pop melody, this sounds instantly familiar” until I clocked what it actually was), but, at 20 songs and an hour long, it’s a difficult thing to take in all at once. Is it even an “album” qua album, as it were? Or is it, as I mooted, just a musical way of Babybird “showing all his workings”, like you’re asked to do in a GCSE Maths exam? I can certainly see it being fascinating. Rob listened: I saw Baby Bird play an early set as part of the first In The City festival in Manchester. There was a buzz about him back then and I remember thinking I didn’t quite get why. I suspect, looking back, that this was exactly the effect he was after and with that one memorable slip-up, he managed to dodge expectations and attention like a slippery eel. There was much to entice in ‘Fatherhood’ and I found myself comparing it to the Big Star records we listened to a few weeks ago (much to the dismay of Tom and Nick, our Big Star correspondents). To me, both sounded like records made without expectation of an audience, like the true expressions of a singular artist who didn’t carry a care for what others might think. This also brought to mind those early Sebadoh albums, similarly crammed with songs. Although totally different in nature, those records were made by two friends in correspondence, again without thought for an audience, and there’s something pure and privileged in being able, eventually, to listen in. Rob read: I can’t believe Nick said ‘qua’ back there. Rob corrected: Actually, I can. Graham listened: Sometimes you come across an tracks and less often, whole albums that seem so personal to the artist, it can almost feel intrusive to listen. The way this is put together seems to me to be more important for the artist to document his work, rather than present it to his audience. One I would need to work my way into.